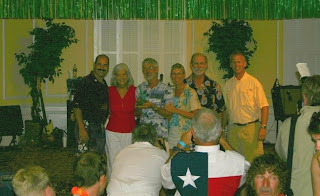 This year we had everyone from our crew the past two years with the exception of Chuck and Sally. At the last minute, they called to say that they weren't going to make it. We added my daughter Melissa to the mix and expected good times. We were not disap- pointed. Bruce had the boat in the slip at CCYC. We were all there on time! Bruce had the crew setting up for a windy ride. We had our old friend Art join us at the pre-race party on Friday night and we asked him to race with us as well. The winds were blowing like never before on a Navy Regatta. We expected to see something in the 30's so we welcomed the weight on the rail. Bruce had planned to sail All Sails on Saturday and Spinaker class on Sunday but with the forecast winds, he opted for All Sails on both days. We made our last minute prep- arations then loaded up the boat to set sail early so that we could check out the winds. Before the start of the race, Bruce had the crew change out the headsail for our smallest jib. It was a good call. We reefed the main and had an absolutely perfect start. We were right where we needed to be at the moment the starting horn fired. The crew settled in on the high side rail. That's where we stayed for the duration of the race which turned out to be the wettest wildest Navy Regatta Ever! I have never had so much salt water dumped on my head and into my lap in my life. There are no pictures. We hunkered down on the rail, Clay just in front of me and were miserable for the entire race. We made several good tacks with great calls on the lay lines. Bruce did a fabulous job at the helm. The crew did well. But it was just a beat. Clay said that they only way it would have been more fun would be if it was cold and rainy. Yes, I said, and if the boat was on fire! But we laughed through it and our eyes burned with tears of salt. We finished the race in good position and made our way into the anchorage. The plans we had made to raft up with Merlin disappeared with the choppy waters inside the breakwater. Boats were separated and crews could barely make it from one boat to another. So we tried hanging out in the water with our floatie toys as best we could. We brought out the Bahama Mamas and the Mai Tais and the beer. It was impossible to keep the salt water out of our glasses. We were close to drowning! My ride was so bad I ditched my drink after the first one. It was not happening! I was not drinking any more salt water today. This will go down in history as my first and only sober Navy Regatta. The guys on the... conveyances that would compete in the Anything-That-Floats-But-A-Boat races later on were bringing out their... boats. The winds were blowing them all in amongst the anchor lines. They had to be rescued by the taxi boats. We though we would be boarded by these Viking types but they moved on. Trish and Curtis made a valliant attempt but finally we all gave up and got out of the water. We all took our sweet time washing up and preparing for the party. We had no trouble getting a ride to shore. The Navy was so good to us. It was a bit different this year. We were all coralled in the O Club bar where we were served very strong drinks. It was OK though. I know many more people now that we are BYC members. I had no shortage of entertaining conversation while we waited. The food was served and we ate and listened to the music until the awards were announced. The mood was very festive and everyone was having a great time. Trish and Curtis had to leave early with sitter shortages. Too bad... We actually got Second Place! We were all thrilled! We left shortly after the prizes were dolled out so that we could all be fresh in the morning. Bruce stayed on the boat for the night. The winds were such that he was worried about boats dragging anchor. Also, our impeller had stopped pumping cooling water through our engine and he had to fix it before we loaded the boat up with crew again. He got it fixed before the crew showed up. He left Matt and Clay to attend the Skipper's Meeting since Matt would be at the helm on Sunday's race anyway. We had every faith in his abilities. Trisha and Melissa Ann were too sunburned to come back for the second day. Everyone else showed up though. The winds were not quite as high and the race would be downwind all the way. It was an easy course. We didn't need the weight on the rail today. Matt got us a perfect start! That's two in a row for us! Woo Woo! We had one mark to round then it was turn down and head for the barn. We were in good position after the mark and didn't have to go wing on wing for quite a while. We were making good time marching up through the boats in the first start. Ruthless and Sweet Lelani were ahead but we began to make up the time slowly. We followed Windswept in changing to wing on wing and settled in for a nice smooth ride. Bruce and I got a chance to sit together on the deck for a while. A rt was instrumental in helping Bruce tweak the sails in minute ways that evidently made the difference in the end. We jibed near the gap at the end of the course and beat all of the boats in our fleet to the finish line. We were thrilled and hopeful that we might even win. A fter the finish, we folded the sails and headed for the CCYC pool. The water wasn't as cool as we would have liked but it was fun. I have to say that I am ever and increasingly disappointed with the food offered by CCYC for these race parties. This year's food has to be the worst. I think we definately joined the right Yacht Club. We hung out hungry in the pool until it was time to go upstairs for the presentation. We were called up for another Second Place after Sweet Lelani's first. Bruce's jaw dropped. He couldn't figure out how in the world we suddenly owed them time on the handicap. We never have before. I told him not to be sour grapes about it and to be happy with our win both days. He was soon in line and happy again. We were glad for the chance to stand up and accept a prize. Many sailors with more seasoned crews than ours had gone home empty handed. I was glad to be able to give our crew another great year's racing to remember. Thanks Crew and Matt... you ROCK!